The 12AL will supply a transducer with a constant current of 4 mA. It has a wide operating frequency range from about 1 Hz (depending on load impedance) to well over 200 kHz. It also has an A-weighting filter which can be switched in or out. The 12AL can be powered either by two internal AA alkaline batteries or from an external DC supply of 3 – 6 V. A regulated mains/line adapter AB0005 is available for supplying external DC power. LEDs are used to indicate battery condition; green for power OK and red for battery low. Another red LED is used to indicate cable break, short circuit and overload. 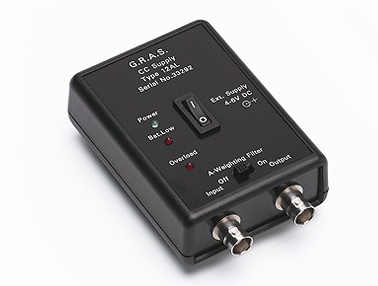 The 12AL has zero gain since the output signal from the transducer is wired directly via 22 μF to the output connector. Zero gain is also preserved at 1 kHz when the A-weighting network has been switched in. The size and weight of the 12AL make it a compact and handy power supply for CCP transducers both in the laboratory and in the field. Download a copy of the AcSoft Equipment Rental Terms and Conditions here. Get in touch to book the 12AL Power Module. AcSoft is an independent distributor of noise and vibration monitoring instrumentation which means we can select the very best products from around the world.